An award-winning researcher and writer, McDonald co-founded the environmental justice movement in the 1980s when he helped lead the fight to create the EPA Office of Environmental Justice, advocated for green jobs programs in poor and minority communities, and oversaw the first comprehensive study of pollution in Washington, D.C. He was also a groundbreaker in the traditional environmental movement in Washington, D.C.
McDonald is the winner of numerous awards including the Ebony Magazine Power 100 Award (2012), the Green Room Energy and Environmental Leadership Award (2012), the National Wildlife Federation’s Conservation Achievement Award (1997), Special Recognition by EPA and the Department of Interior (1996), EPA Environmental Equity Award (1993), Global Tomorrow Sustainable Development Award (1993), Malcolm X Cultural Education Center Community Service Award, andEnvironment Magazine Award (1991). McDonald is author or co-author of a series of ground-breaking technical and scientific reports including: Our Unfair Share: A Survey of Pollution Sites in Our Nation’s Capital, Our Unfair Share II: Pollution in Washington, D.C., and Our Unfair Share III: Race & Pollution in Washington, D.C., in2001; Energy Efficiency Strategies for Multifamily Rental Housing, 1981;Comprehensive Utility and Grounds Survey, St. Elizabeth’s Hospital, 1985, and the Review & Evaluation of the Energy Conservation Company (ECCO) Pilot Project: Preliminary Analysis, Regression Analysis, Final Engineering Analysis, 1986. McDonald and his work are regularly featured in national media including ABC, NBC, CBS, New York Times, Washington Post, USA Today, Baltimore Sun, and the Los Angeles Times. McDonald was the first environmentalist and environmental justice activist to support nuclear power plants for their clean air benefits. An asthma sufferer, McDonald has made the case for nuclear as a clean air and climate mitigation technology on NPR and in other news media, has visited nuclear plants in China, and France, and is working to prevent the premature closure of nuclear power plants. McDonald has served as member of the Maryland Governor's Environmental Justice Advisory Committee, EPA Water Conservation Advisory Committee, Maryland State Water Quality Advisory Committee, and as chairman of the board of the ACLU of Prince George’s County, served on the board of directors of the Accokeek Foundation and advisory board of Environmental Progress. McDonald drafted the New York City Environmental Justice Bill 886 that was signed into law by New York City Mayor Bill de Blasio on April 25, 2017. McDonald drafted the original bill for Council Member Charles Barron in 2003 and he introduced the bill (Int. No. 404) in 2004 with seven cosponsors. After meeting with Council Member Inez Barron in 2014 to request re-introduction of the legislation and after much review and revisions by the Committee on Environmental Protection, Council Member Inez Barron introduced the legislation that was signed by Mayor de Blasio. Samara Swanston next to McDonald, New York Mayor Bill de Blasio and Bill Sponsor(s) Inez Barron, and Costa Constantinides. McDonald has long combined his commitment to social justice and his love of nature by leading hands-on grassroots efforts for recycling, home weatherization and audits in poor neighborhoods. For more than three decades McDonald has led visits to toxic waste sites, power plants, drinking-water plants, sewage treatment plants, and creek walks all that exposed white environmentalists to the realities of poor communities of color. From 1979 to 1986, McDonald directed the Energy Conservation and Transportation program at the Environmental Policy Institute (EPI), which later merged with Friends of the Earth (FOE). McDonald helped lead the fight in Congress in the early 1980s to maintain Corporate Average Fuel Economy (CAFE) standards, testifying before Congress as well as federal and state agencies. And McDonald successfully advocated for the 1986 Federal Shared Energy Savings Act. McDonald is a certified Hazardous Waste Site Inspector, and was a National Environmental Policy Act (NEPA) instructor in 1997 for the U.S. Department of Agriculture Graduate School. In 2002, McDonald helped pass the first civil rights law of the 21st Century, the No Fear Act. 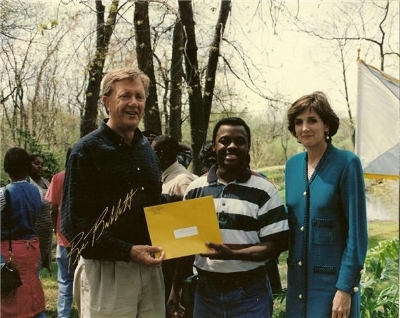 McDonald started one of the first minority environmental internship programs in 1989, which placed black college students in national environmental groups. McDonald spends most of the year on Catalina Island, off the coast of southern California, and Washington, D.C.
On Wednesday, November 14, 2018, McDonald was presented with a proclamation from the New York City Council recognizing his environmental work.